There is a base level of service that all Google Maps experiences provide, but being signed into a Google account really changes the amount of information available to, and usable by, the user. One of the obvious areas where personalization can be seen is during a search. 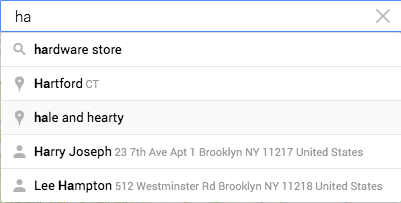 Google indexes not only your contacts but your map history to provide the most relevant location results possible (this is why I always try to save my contacts' addresses). Another way Maps can be tailored to your needs is the inclusion of calendar event information displayed on the map. If I have an appointment on the same day, and the location of the appointment (again, needs to be stored in the calendar event) lies within current map view, Maps will display a marker showing the appointment time and estimate of travel time. I couldn't get a screenshot because it seems to take a bit of time to index this information. You can also explicitly tell Maps about your favorite locations, like Home and Work. Keeping this up to date ensures that Maps will always try to anticipate your commute across other services like Google Now. The bottom line is: always save address so that Google Maps can make your life easier!